The holidays call for extra special attention to décor, especially when it comes to the dining table, where friends and family gather to celebrate. 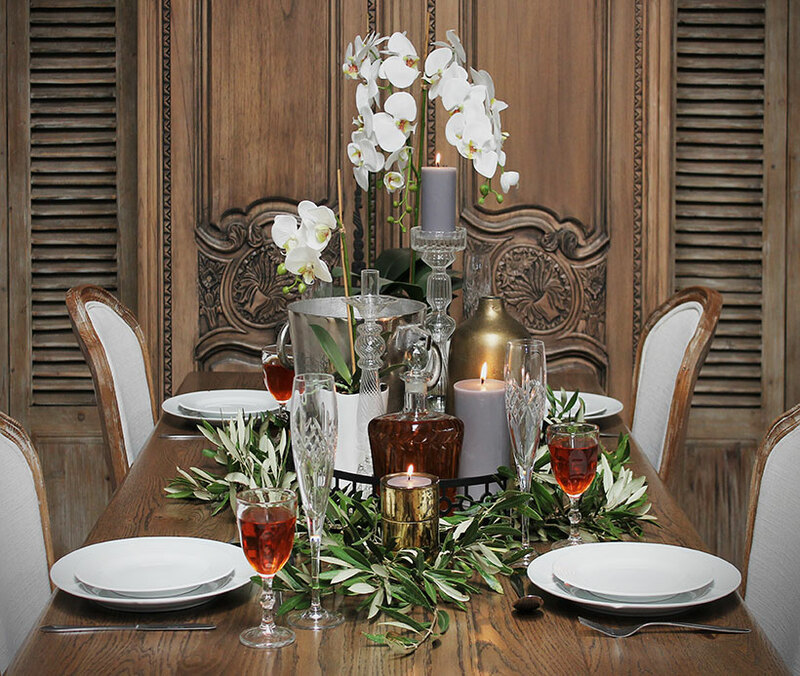 Simplicity is always the key to creating stylish festive décor. Choose a tray or plate with an opulent but understated feel. Materials like mirror or metals are a good starting point. We chose the Layla tray which has a mirror base and detailed black border as our starting piece. The reflective nature of the mirror helps to create that feeling of luxury. Flowers are a great way to keep the whole centrepiece looking fresh while adding some height. Choose a flower that complements your décor items. We chose two potted orchids to offer up a cascade of petals, going with a neutral pot to maintain that summery freshness. Next add the items that fill out the centrepiece. Choose décor objects of varying heights and materials. Opt for cut glass and metallic finishes for an opulent feel. Given that South Africa’s festive season is in summer, be sure to include good-looking ice bucket to ensure drinks stays nicely chilled. Now is the time to place your cutlery and crockery too. A festive centrepiece wouldn’t be one without a few lit candles. They offer ambience while adding variation on height to the rest of the composition. For a table of six, be sure to add between six and four pillar candles of varying sizes to the centrepiece to give it that luxurious celebratory feel. Lastly, add some greenery to pull the look together, and you're done! Visit your nearest store to see the latest accessories on offer and start planning your festive table centrepiece today.